After our explorations in and around Hue, and our 600km or so round trip out to the Phong Nha-Ke Bang National Park, we felt that what we really needed at this point was a bit more time on some scooters. Fortunately, Top Gear (yes, the BBC car show) could help us out. 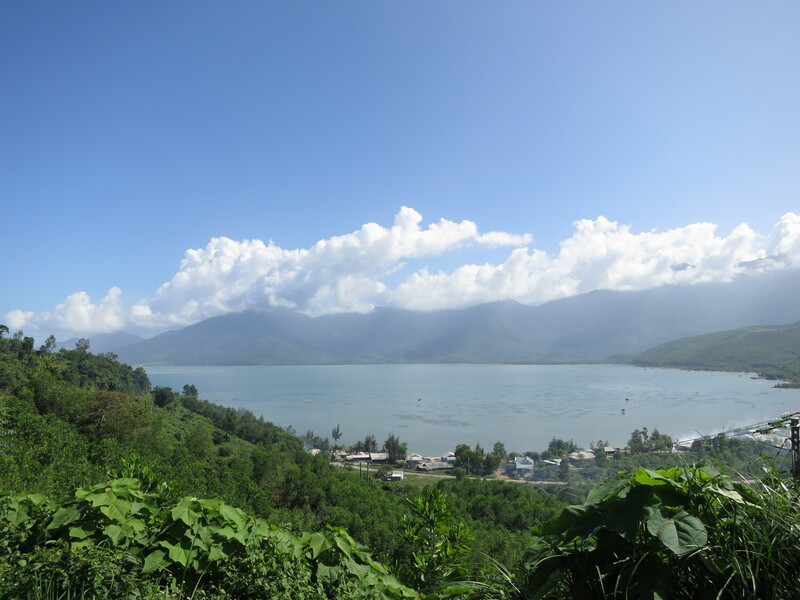 In their Vietnam special, they’d made a point of extolling the virtues of making your way along a bit of road called the Hai Van Pass, between Hue and Hoi An. We were in Hue. Our next destination was Hoi An. The place we’d hired scooters from the previous day, the Why Not? Hotel, had another scooter-related service which we happily took advantage of. We dropped our bags with them and picked up the same scooters we’d ridden the day before. (Strangely, they had less fuel in them than when we dropped them off: when you hire scooters in Vietnam, you can be certain that they’ve siphoned all the fuel out but a few vapours – enough to get you to the nearest petrol station, no more.) The arrangement is that you ride your scooters to your nominated accommodation in Hoi An, and later that afternoon, a couple of local employees will bus across with your bags, which they’ll deliver to you in return for the scooters, which they’ll then ride back to Hue. All for a price which was so ridiculously low that I can’t even remember. Around $30 each, I think. … except that where I said, above, that they leave you with just enough fuel to get you to the nearest petrol station, well, we must have missed the nearest one. So I sputtered to a stop, this time genuinely out of fuel, not five minutes ride from our beginning. Pushing my empty scooter along the side of the road, I was the recipient of many a bemused expression, and many an offer of assistance – especially from the hoardes of street sellers who would be quite happy to sell me petrol in a 1L plastic water bottle (this is how many of the locals purchase fuel – but not a recommended purchase point, given that god knows what fuel/water/whatever concoction is actually in those bottles). Eventually, as I was slowly making my way to where I had managed to divine (from hand signals and a smattering of the locals’ valiant attempts at something resembling a language that I as an ignorant foreigner might speak) the nearest petrol station would be, one enterprising helper rode up beside me on his own scooter, gestured that I should sit on mine, and proceeded to push me along to the petrol station, riding his scooter with his right leg outstretched to push mine forward via the exhaust. Not a procedure that your driving instructor would recommend, I imagine, but it got me safely, and entertainingly, to the petrol station. Handing the gentleman all of the equivalent of about $US1 for his trouble seemed to produce a happy, satisfied reaction, and so everyone ended up well-pleased with the endeavour. Top Gear was right: the ride was incredibly scenic. 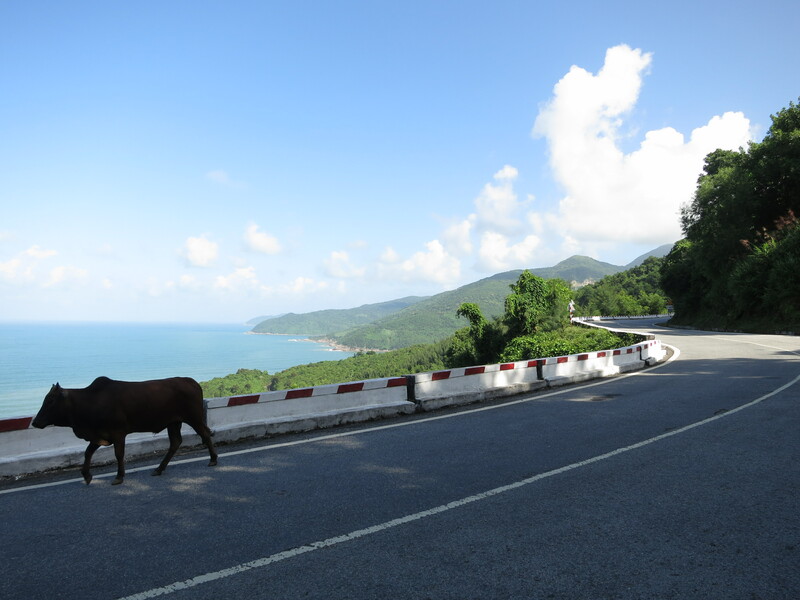 It’s a coast road, winding around the side of some particularly verdant hills. And it’s all the more pleasant for the fact that there’s a tunnel under the hills now, so that the only traffic going via the pass is there for the scenery: you’re not contending with mad locals on their commutes as you lap up the views. So with little traffic, a decent-quality road (for a change), and fantastic views, our only real worry was avoiding the cows and goats that occasionally graced the asphalt. And indeed we did enjoy our lovely day of trouble-free riding: and for once, we appreciated reaching our destination well before dark for a nice lazy evening in Hoi An. There’s not a lot to write about our time in Hoi An. It’s a particularly touristy city – although in a pleasant kind of way. It’s enjoyed a rise to fame in the last few decades thanks to a booming tailoring industry: Hoi An is the place to come in Vietnam to get your suits, shirts, dresses, etc., tailor made. Far be it from me to forsake an opportunity to experience the local specialty, so I ended up having three shirts custom made. (Six months of sweaty travel in shirts that were already years old meant that I could probably do with some upgrades anyway.) We didn’t have much time before setting off for Saigon, though, so they had to be done in less than 24h. Thankfully that wasn’t a problem – that’s their typical turnaround time. So having picked out some fabric on Saturday afternoon, I was back Sunday morning, braving the torrential rain, to pick up my three new shirts and part with the second half of the $US50 price tag (total, for the three). A good deal, too: I’m finishing this post many many months after Vietnam, and still I’m travelling with those same three shirts as my everyday wear: they don’t look terrible, they’re easy to handwash in the shower, they dry quickly, and they’re still not falling apart. I’m suitably impressed: I’ve swum in them (for sun protection), worn them out to fancy restaurants, and worn them with boardies and thongs (flip-flops) for a stroll along the bogan beaches of the Thai tourist isles. Versatile and comfortable: a genuinely good investment. Other than the tailoring, we had not much interest in Hoi An’s other tourist attractions. The Japanese covered bridge didn’t really impress, and we didn’t feel a particular urge to experience the various old temples scattered around town. Pretty much the only other thing was the beach – and we didn’t make it out there, partly because we didn’t get around to it, and partly because half the time it was pouring with rain. 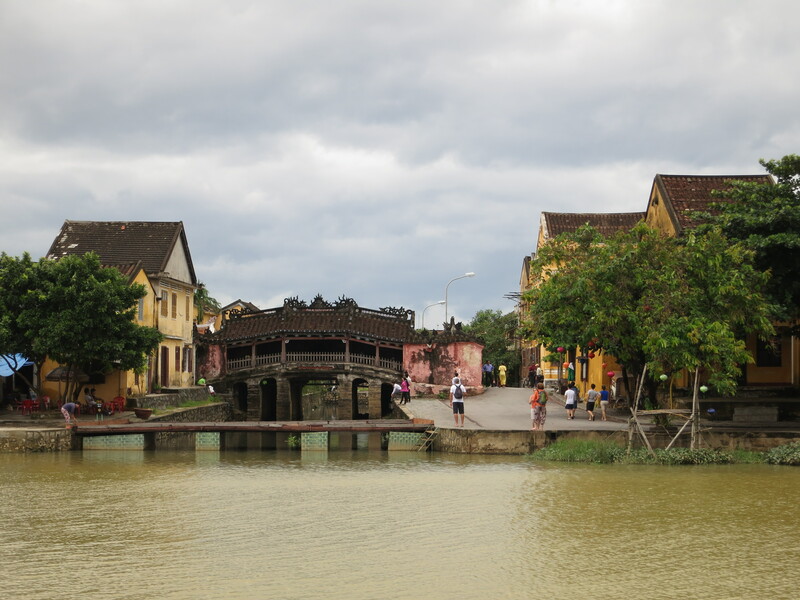 The Japanese Bridge in Hoi An, seen from across the river. In fairness, not the most fascinating tourist attraction I’ve ever come across. What we did do, though, was catch up with other travellers, in some of Hoi An’s many fantastic bars and unassuming restaurants. Quite by chance we ran into a charming American couple we’d first met in Cat Ba, and we thoroughly enjoyed catching up with them and getting their recommendations of the local tailors. And we knew that Kiwi Steve (whom we’d met in Nepal) was coming through – we’d already established that he was doing our Vietnam trip roughly in reverse, so this was us crossing half way – so we caught up with him too. He’d come up from Saigon on the back of a motorbike, on an Easy Rider personal guided tour. (Which, by the way, he very very enthusiastically recommended, in case anyone’s wondering if it’s worthwhile.) Obviously we had to made fun of him for not having taken charge of the bike himself, and we had to recommend that he rectify that particular deficiency by doing the reverse of the trip we’d just enjoyed, over the Hai Van Pass. And so we made those recommendations over a few beers, once Steve had made his own circuit of the local tailors. After those beers, we did some more catching up, and traded other accumulated travel advice, over some more beers. And after that, some more beers. 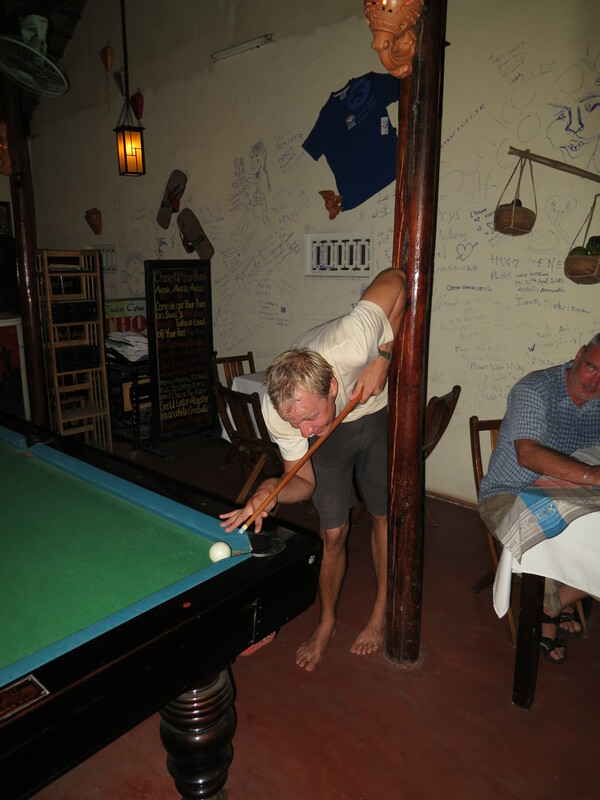 And some cramped pool-playing, and then some more beers. All up, the evening involved an awful lot of beer consumption. Not a lot more pool playing, because the pub at our final stop closes the pool table halfway through the evening so that it can be covered with boards and transformed into an impromptu raised dance floor. But still, a fun night was had by all – a group of somewhat drunken tourists enjoying being tourists in a very tourist town. I’ll spare you the gory details. The pouring rain will have washed away any trace of misbehaviour by morning anyway, I’m sure. Won’t it, Steve. Eventually we all made it back to our hotel: Chris and I had to rest up for a long train trip to Saigon the next day, and Steve had to mull his tailoring options and plan a trip over the Hai Van Pass. Once we’d parted ways, there were resultant issues for both groups afterwards, unfortunately: Chris had managed to get a stomach bug that plagued him for the (long!) train trip to Ho Chi Minh City, and Steve enjoyed everything about the Hai Van Pass trip we so strongly recommended to him – except the bit where he came off his bike, done in by a smattering of gravel on a hairpin corner. 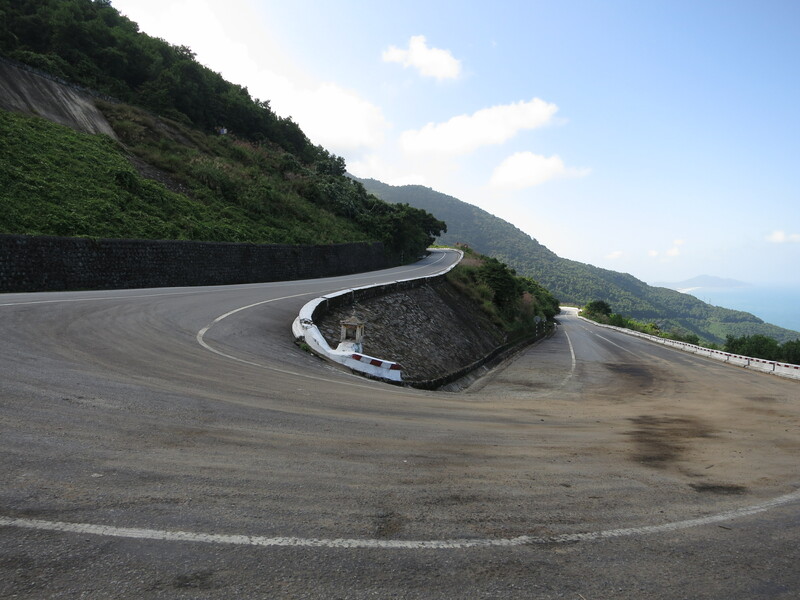 A hairpin on the road leading up to the Hai Van Pass – possibly the scene of Kiwi Steve’s misfortune? But those were minor blemishes. (Albeit it in Steve’s case ones that required a bit of ongoing medical attention.) Our time in Hoi An was done, and we’d had a blast – and I had the nicely fitted shirts to prove it. This entry was posted in Travel and tagged vietnam by Sam Roberton. Bookmark the permalink.